There’s something about magic that draws both young and old people in. When I was younger David Copperfield kept my imagination busy wondering how on earth he performed such amazing tricks – even now I don’t know and if I’m honest I don’t want to know as the element of not knowing makes them that little bit more “magical”. These days My Three are the same, they love Dynamo and most recently Darcy Oake from Britain’s Got Talent – we love nothing better than sitting down together and watching them on TV. Both them and I are always fascinated by the tricks that they see being performing. Since then the boys have been asking for a magic set of their own so that they can perform their own tricks. I have spent many hours looking for the perfect set for them but came unstuck as the ones I did find looked too complicated or didn’t have great tricks in them. Recently Drumond Park came to my rescue and sent us their brand new Gee Whizz – a box of magic tricks. I was a little sceptical at first as I wasn’t sure that this set would be any good for the boys either. But I will say that I was totally wrong and changed my mind once the boys started creating their tricks. 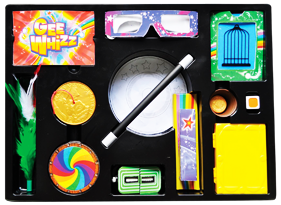 Gee Whizz (RRP £19.99) is suitable for children aged 5 + . It is full of basic tricks which are perfect for beginners to master. As the tricks are so easy to complete they will help your child to gain confidence and become more enthusiastic the better they get at them. For stockists and to play games online visit www.drumondpark.com. Each Set contains a wand, a flower pot, a colour change coin, a super dice tunnel, a pair of firework glasses, a super coin saucer, a super spinning discs with base, 4 Shadow cards, a magic card case, a parrot in a cage, a ziz zag rope, and who’s bigger cards. The set has clear well set out illustrated instructions and we found that James needed very little guidance from myself when performing his tricks. We found that so longs as the tricks were set up correctly they pretty much did themselves. As they are so easy to master there isn’t much to remember on how to make them “work. His favourite tricks were definitely where he could magically ‘grow’ a flower from the end of his magic wand and changing the colour of a dice by simply pushing it through a magic tunnel or maybe it was making a parrot appear in an empty cage. There are lots of other tricks to choose from too so I am sure he will never get bored.